The annual Open Garden Squares Weekend takes place 8-9 June, and Charlton Manor Primary School are opening their doors to the public to show off their Secret Garden. 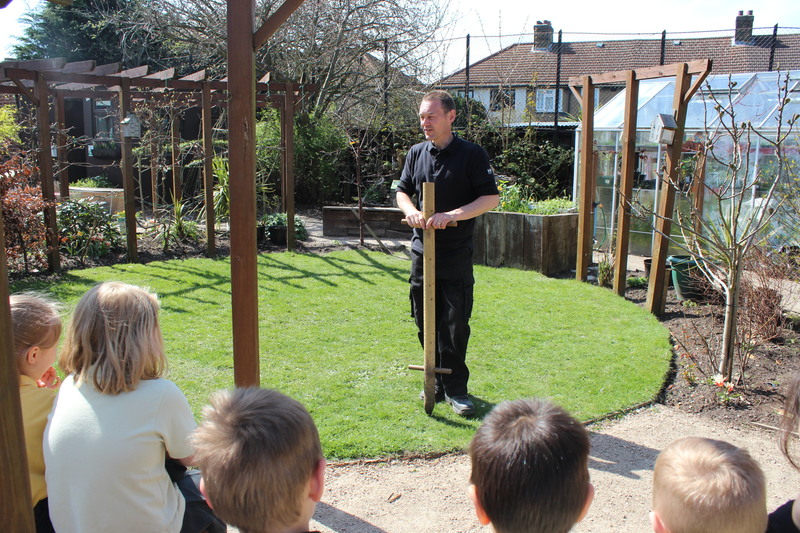 Visitors will get a tour of the garden and a talk about how the garden is used to support the curriculum. For those that wish we will also give a tour of the children’s kitchen.There will be tea and cakes available on the day. The cakes are made from produce in the garden, ie eggs, honey, carrots etc. The Secret Garden at Charlton Manor is hidden behind the dinner centre. It provides the children with a quiet area to go at break times and at other times during the day when they may have difficulties concentrating in class. It is packed with learning opportunities and as well as having allotments, a greenhouse and raised beds it also has 4 bee hives, a chicken run home to 10 chickens of different breeds, a stag beetle environment, a composting area containing 4 different composting methods including a wormery, a hide for bird watching, a bird box with cameras linked to the internet, a wildlife area together with pond and an area for conducting investigations using computers such as pond dipping. The children use it through most of the curriculum. Much of the produce is used in the school’s newly built teaching kitchen, enabling them to understand how this all fits with healthy eating. Champion readers may have seen the school featured on BBC News recently, as they contributed to a garden at the RHS Chelsea Flower Show. Pupils have been attending the show and manning a stand to tell the public about the plants they grew, and have been visited by a number or members of the royal family and celebrities visiting the garden. This correspondent went along to the school’s Open Garden event last year and enjoyed the experience very much (the cake was particularly good). Why not call by to see what’s going on in this green-fingered corner of SE7?